Late Thursday evening, shortly after 9 P.M., Pittsburg officers responded to a residence on Hermosa Avenue in regards to a stabbing. When officers arrived, they found a man outside suffering from stab wounds to his upper body. The man was transported to John Muir Medical Center in Walnut Creek where he later died due to multiple stab wounds to the upper body. 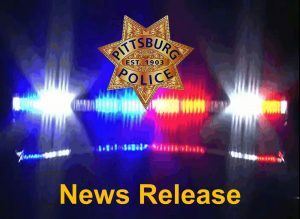 The Pittsburg Police Department Investigations Division and CSI Team responded to the scene and took over the investigation. Detectives quickly contacted witnesses to the incident and obtained a description of the suspect and a car that was seen driving away from the location. The car, a white four-door sedan, was later determined to have fled the area towards State Route 4. Detective utilized the city of Pittsburg’s surveillance camera system, along with the recently installed county-wide Freeway Security Network, to locate the sedan as it traveled eastbound on State Route 4. With the use of this surveillance system, detectives were able to obtain a license plate for the car. Detectives later authored an Arrest and Search Warrant for a residence located in the town of Knightsen. The Pittsburg Police Department tactical team conducted the service of the warrant early this morning and took the suspect, identified as Jimmy Lee Biles, Jr. (48 years old), into custody. It is unknown at this time the relationship between Biles, Jr. and the victim. This case remains an active investigation and no additional details are available at this time. The name of the victim is being withheld pending notifications. This is the City of Pittsburg’s third homicide of the year.